This website has a clear copy of Brian Epstein's signature. 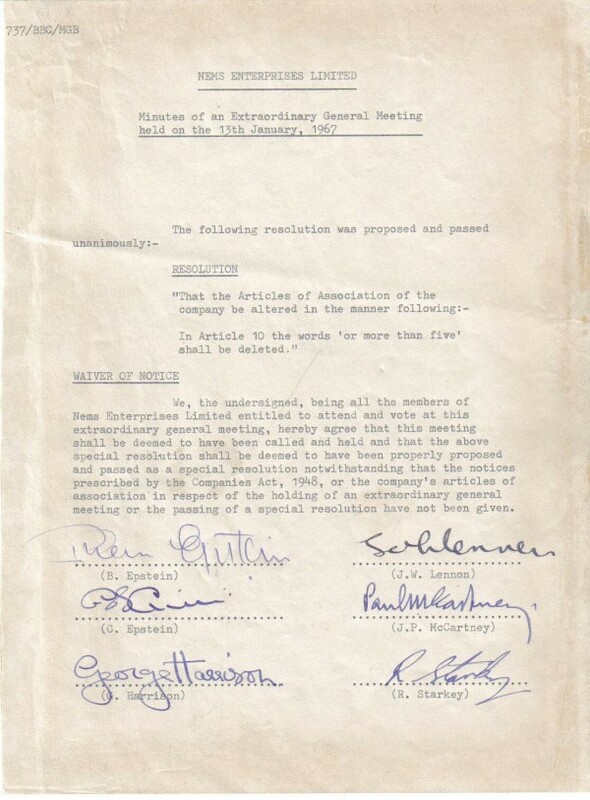 Rare NEMS Enterprises Limited contract from January 15, 1969 signed by all four Beatles plus manager Brian Epstein and his brother Clive. Full contracts from 1964 through 1969 are very difficult to obtain. This was Brian Epstein's personal copy of The Beatles Hard Days' Night 12' vinyl by Parlophone with Brian's handwriting. This was one of Brian's personal collection that was eventually auctioned to Rockaway Records after Brian's passing and the passing of Gareth L. Pawlowski, who acquired Brian's private collection. I really like John's way of writing his whole name was one word. Brian's got a cool way of writing E's, too.